I love lentil bites. They are super easy to make, freeze well for later, and can be eaten alone, with pasta, or as a sandwich (like this one!) 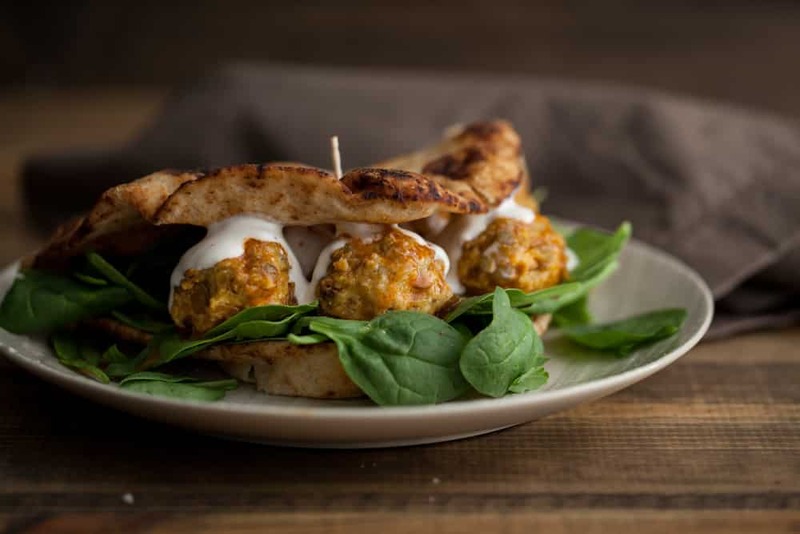 I occasionally whip up a variation of lentil meatballs but for this sandwich, I followed Sara’s recipe. The result is a moist meatball that soaks up the hot sauce. I drizzled a bit of ranch on the sandwich but I’ve also melted blue cheese on top before (and yes, if you like blue cheese, this is the way to go!) I would also recommend throwing a few caramelized onions on the sandwich. Whip up the meatball recipe according to Sara’s directions. While meatballs bake, combine Frank’s red hot and butter in a sauce pan. Heat until butter is melted. Taste and add more butter as desired to reach a comfortable spicy/heat level. When meatballs are done, toss with the sauce. 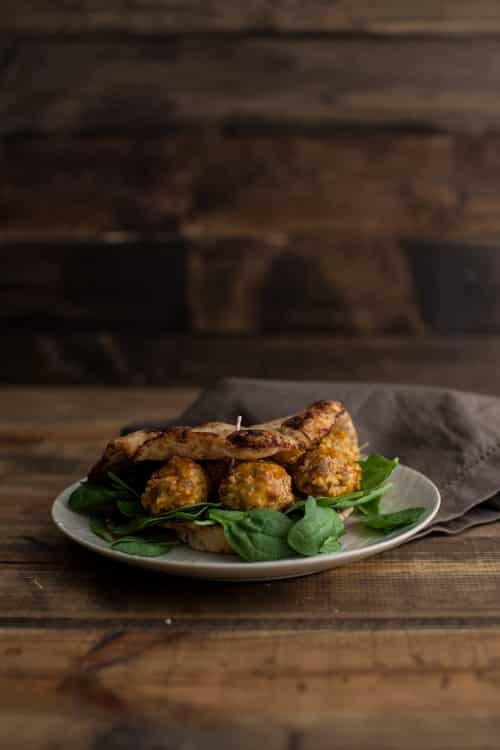 Layer spinach, then meatballs, and sprinkle (or drizzle) blue cheese or ranch. Serve while still warm. *This sandwich works equally as well with bbq sauce! This recipe makes me so happy…I’ve been needing more healthy ways to get my buffalo sauce fix! I never had lentil meatballs but I’m going to try to make them this week, maybe add some chopped up kale too. Can’t wait – thanks! I’ve been fantasizing about a good veggie meatball recently and I totally forgot about Sara’s recipe! Shame on me. Love that you’ve infused it with buffalo flavor…which is one of my favorites! HI, what is Frank’s Red hot? Hi Pegah, it’s a type of hot sauce. 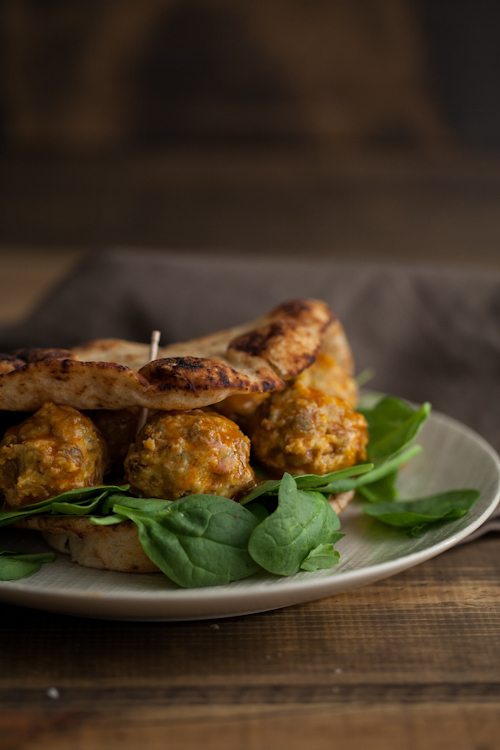 Lentil meatballs are a great idea. I LOVE lentils! This looks great! One of the things I miss most from my non-vegetarian days is meatballs! I’ll have to try this out! 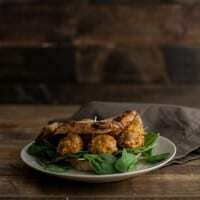 love the idea of lentil meatballs! I’ll have to give this a shot! Damn lady, I can’t believe I’m about to say this about fake meatballs, but those are beautiful! Can’t wait to try ’em. I’ve made Sara’s lentil meatballs numerous times + absolutely LOVE them. My husband will be all overrr this buffalo sandwich variation. Thanks, Erin! Erin, these meatballs are delicious! I´ve made them several times, and can´t believe how easy and tasty they are. My kids love them! Made this for dinner tonight and it was delicious! Thanks Erin for another fabulous recipe! So I made these and they were delicious, but they were very wet so I ended up making them patties and not meatballs. They had a texture almost like hummus. Wonder what I did wrong…But I guess it doesn’t matter because they tasted great. This is my new favorite recipe. I am never a fan of faux meat anything really, but this sandwich was next level amazing. I used blue cheese crumbles instead of dressing and added some cooked spinach to brighten it up/up my veggie intake. Wrapped it all up in a whole wheat pita pocket. To say this is making it into my monthly rotation is an understatement! NOTE to people making the recipe: The lentil balls seemed a little wet when I was rolling them, but firmed right up when I baked them. Love your blog and recipes — I’m in a similar household. Try to make different recipes and your blog is one of my favorite. You shared so simply and easily.